Friday was a travel day. Saturday and Sunday was a blur of talks, presentations, more talks, a hands-on lab experience, and vendor exhibits. All with one goal in mind – educating current and future students. The depth is in the details, how to help them discover geography and spatial relationships, expose ways of asking questions and seeking solutions in what ever discipline they choose. San Diego is a great town for a conference. Yes, the climate is nice. Today was sunny, warm, about 74F or 75F. The last two days were chilly and cool and views of CVN-76 were hazy. This afternoon, CVN-76, the aircraft carrier Ronald Reagan was clearly visible. No pictures to share as I was being dutiful and giving my university their monies worth, attending every session, sitting up front, being attentive, and tweeting details to my followers through three different accounts. San Diego is a great convention town. Pick a good place, like Dees Newbreak Coffee & Cafe, and the staff is cheery ands calls you, “hey, friend.” Ralph’s Gaslamp is the only place to shop for groceries and while the store is tiny compared to giant grocers, they cram fresh food, fresh deli, beer, wine, spirits, specialty meats and veggies into a well-managed space. I like walking beside people out walking their dogs. Llasa apso, French Bulldogs, Whippets, and herds of terriers and Chihuahuas are ubiquitous. Something about seeing happy little pups skipping gleefully down the sidewalk, head up, eyes open, gives me the sensation all is right with the world, even when the dog-walker themselves look glum and sullen stumbling along, enshrouded in their personal mental fog. Yes, San Diego is also teeming with homeless folks of all stripes. During the day, the homeless are not so obvious. They are up, moving around the city, mixing in, shopping, drinking coffee, shifting their meager belongings from one alcove to the bushes beside the train that runs to San Ysidro. In the morning and at night, though, they are as obvious as fire hydrants, and perhaps as numerous as traffic signals. No avoiding them, no way not to notice them. The vast majority are quiet, polite, and keep to themselves. At night, some might sing, or play songs on their acoustic guitar. San Diego is an international town. Walk the streets anytime, day or night, and no telling what language you’ll hear, Portuguese, German, French, German, Swahili, Chinese, German. Seems like San Diego is popular with Germans. Some visitors seem off-put by the poverty and homeless. I can see it when Dad pushes his kids past the skinny old guy in the dirty Army-green jacket, or the family which hurries past the jabbering old woman whose eyes don’t look in the same direction. And even with the odd contrast of wealthy Europeans against the decrepitude of beautiful San Diego I still think San Diego is a great conference town. Opening the windows in my hotel room is the best part of any trip for me. No, not for the air, though San Diego air temperatures are precisely what most people set their air conditions at. No, I open the windows to absorb the city sounds. 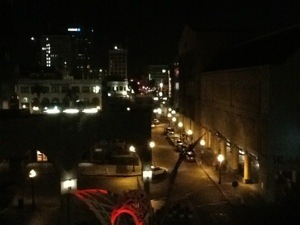 The muted hum of San Diego’s evening rhythms I find soothing. Right now, a woman sings, her lilting tremolo vocals reach my fourth floor room. I can’t really make out the lyrics or the tune. Some guys laugh over some shared story I couldn’t hear. A car peels out. A San Diego transit bus powers up E St. The valets mutter. But a hum like an electrical transformer, like when your working under a flourescent workshop light, is right there under every other sound, and you may not even be aware of it but if it were to stop, go silent, then you would notice. That winter quiet which only comes around after a snowfall and power loss. Saturday night, girls laughing and clattering of their high-heeled shoes made tonights sounds seem acapella. Saturday night had the percussion of taxi doors slamming shut. Not so much percussion tonight, just a girl doing a passable Jewel. The city sounds make San Diego a great conference town. This is as high as I can afford to rent. If I could afford it and if it were possible, I would rent 10,000 floors up, just so I can escape the surface, and the miserable people walking their exuberant dogs. Come to San Diego and visit the Gaslamp Quarter. Use Yelp to find good places to eat, drink, and be merry. Seaport Village is a nice touristy place for buying stuff which parents and kids can attach memories to and eat. Sidewalks on the bayside of Pacific Coast Highway run past the aircraft carrier Midway, the Pier, and the Star of India. The best and perhaps cheapest way to get from the airport to the Gaslamp Quarter is the bus. At $2.25 a person, its as fast as a taxi and cheaper. Sure, walking to the hotel might be a block or two, but use Hotwire or similar service to find a place near the bus stops can help reduce that extra walk. The caller reports hearing 12 gunshots. Where do we need to lay down the spike strips? On the off-ramp to the northbound lanes? We traced the lo-jacked vehicle to Mexico. We may need to call for an assist to retrieve. San Diego isn’t perfect. But to get away, to listen to the downtown pulse of another place, and to feel even momentarily like Humanity is on the right course, San Diego might be the place for you. No, I was not paid by the San Diego Tourism Bureau. This is just me, writing.